Sometimes joy is found in the unlikeliest of places. We all analyze, document and read up on other dimensions, getting ready for the big shift, and forget we are all here in this incarnation with purpose. A wedge-tailed eagle with a wing span of over 2 meters swooped over my vehicle as if escorting me to the grid. A white blaze that looked like the trail of a meteor dropped down to earth like a lazy shooting star and disappeared. All 3 of my radios, and my 2 satellite phones all beeped at me at different frequencies as if they were singing. When I returned the electronics pack and my in-vehicle tracking device this morning on my way home the control room operator advised that I had dropped off the map for roughly 1 hour. With all this ‘vortex’ synchronicity the real wonder happened 2 days ago. 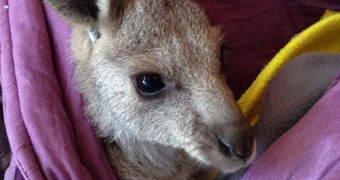 I was driving yet another stretch of bushland when I came across an injured kangaroo. I managed to euthanize her and find her little joey, who she had ejected a few meters away in the bushes, alive and well. I have since left the little one in capable hands. The last I saw he was being cradled and bottle fed by a 6’5 bearded, tattooed miner with a couple of good teeth named ‘hammer,’ who I came across on my travels. The sky may offer some mystery, but for all the flat and desolate bushland this country offers it sure is crammed with a fair few miracles itself. Don’t forget to look for them on earth, sometimes hiding under a tiny barren bush offering the faintest of heart beats. Copyright © 2014 -2017 TruthIAM. All rights reserved.